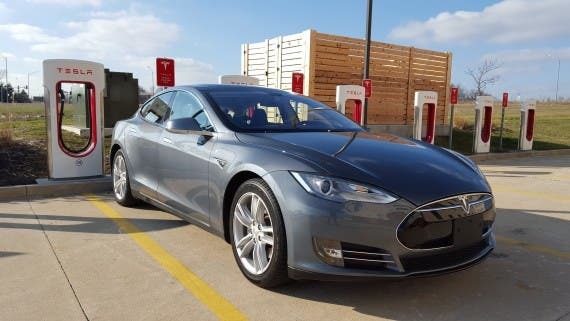 Upon rolling out of the Tesla Dealership… er… Service Center in Columbus, Ohio, a few things hit me right off the bat: The new-car feeling, realizing that this was my car. The realization that now I really was pretty much on the other side of the country and actually had to drive back across the ~3,700 kilometers at around 33 hours of driving. The fact that I only had one room booked between Ohio and Vegas … and what the heck, I just bought a Tesla!?! I wanted to take off like a bat of hell and drive 120 miles an hour down the road, tearing up the asphalt… but I’ve been there and done that and tickets (and accidents!) are expensive no matter what state you’re in. So I calmed myself down, took a sip of the coffee CJ had so generously hooked me up with, set the cruise control for 65, and pointed the wheels to the west. 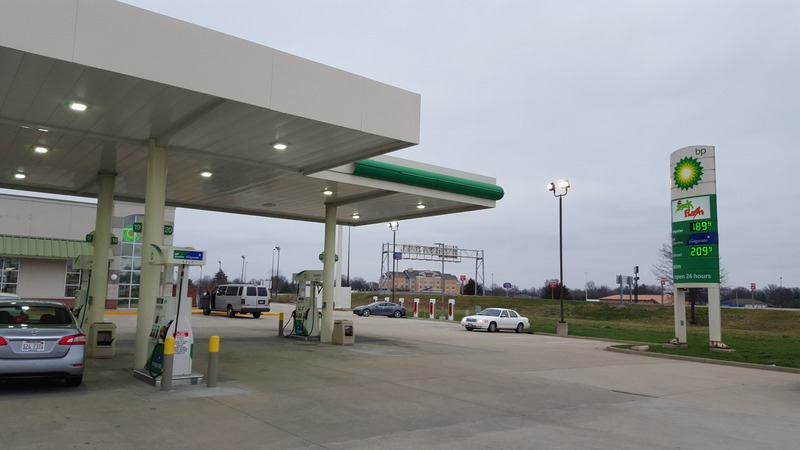 The next day, after a few hours of rest, several stops at Superchargers, hundreds of miles, and too many cups of coffee, I had a good feel for the car and how it worked on long road trips. While the car generally met my expectations, a few things stuck out to me about the car that I hadn’t expected. Locking the car, for one. The Model S automagically locks (it’s an optional setting) when the driver walks away with the key fob. At first, I would nervously look out at the car from the gas station, coffee shop, or lunch stop to confirm that the handles were in, lights were off, and all that. After several stops, I realized that it just works. Put it in park, get out, walk away, and you’re good. It’s awesome. No parking brake, no locking or unlocking the car… easy. The power of the car is also amazing. With a single-motor, non-performance version of the Model S, I was not expecting amazing performance, but it blows me away. I used to have a ’97 Pontiac Trans Am, which I had done some work on, so I’m familiar with performance cars, but the smooth, torquey power of the Model S is a different beast altogether, and a lot more fun in my opinion. Going 30 but want to go 65? Done. Going 65 and want to pass the smoggy diesel pickup in front of you? No problem. It’s something I’m still working on dampening, as it just begs to go faster than most laws allow. My favorite is pounding the pedal while cruising at around 20–30 miles per hour. It jumps like nothing else… okay, except may be a P90D with Ludicrous Mode :D.
I will go into more detail about Supercharging in a separate article, but suffice it to say that it blows the competition away. Triple the speed of the next fastest charger, predictable, built into the navigation, and easy to use. It’s great. I loved being able to punch in whatever destination I wanted, however far away, with the confidence that the car would navigate to the nearest charger automatically. 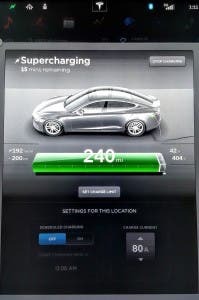 Most of the Superchargers were located at hotels, gas stations (of all places! ), shopping plazas, and otherwise near facilities that could occupy 30 minutes of a day, which was nice. A few stops required a bit more creativity to answer the calls of nature or get a bite of food. I found the ability of the car to keep the heating on while charging to be a great feature that I took advantage of extensively on my journey. One glitch that I noticed in the navigation is that, after topping up at a Supercharger then heading down the highway, the navigation would occasionally try to route me back to the charger I had just left (after charging for the amount of time it told me to charge for). This even happened a few times after I was 20 minutes down the road like it suddenly realized I needed more capacity to make the next charger. It did not make sense to me, as I typically had 50–80 miles of “spare” range above and beyond what was required to get to the next charger. It was not a deal breaker and I was able to manually navigate through it by turning off charging stop recommendations, but it seems like a bug in the logic that could be corrected. Along similar lines, the navigation is conservative, but with caveats. First — it is conservative as it tries to ensure that you have WAY more charge than needed to get to the next destination. If I’m going 65 miles to the next charger, it wants me to have at least 110 miles of range to move on. The caveat to the estimated range is that external factors like elevation gains, climate controls (heating/cooling), driving speeds, and outside weather can (and did!) have large impacts on range. It was not clear if the navigation was actively taking those factors into account — or at least for the static, predictable factors — but it seems like it could more accurately describe why it wants more charge at certain times. The video below details some of my jumbled learnings from the road. I was happy to find that the speedometer display was the right angle to capture this specific angle with my phone, making it easy to record videos and video chat with my kids while out on the road. Technology is amazing.